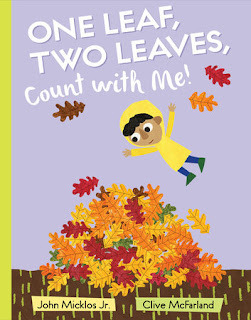 A RUP LIFE: One Leaf, Two Leaves, Count with Me! In New Jersey we experience the most wonderful change of seasons. Winter is cold and often we get snow and ice. Spring brings new blooms and often rain as the weather changes to milder temperatures. Then summer hits you with a blast of heat, perfect swimming weather. Lastly, Fall - my personal favorite season- brings cool temperatures but not too cool and the changing colors of the leaves. It is a wonderful state to live in. In One Leaf, Two Leaves, Count with Me! by John Micklos Jr and Clive McFarland we go on a counting journey through the seasons. I love how this book uses the changing seasons and the trees to weave a story. It isn't just counting but it shares weather along with the seasons. It is really a wonderful addition to any season but as we have just entered fall, I've added it to my October Book Bin. Count your way through the seasons! In spring, the tree’s leaves appear, one by one. By summer, there’s a glorious canopy. And when autumn winds blow, leaves fly from the tree, one after another, leading us into winter. There’s a world of activity to spy in and around this beautiful tree as the wild creatures, and one little boy, celebrate the cycles of nature. As little ones count leaves, look for animals, and enjoy the changing seasonal landscape, bouncy rhymes and bold illustrations make learning to count easy—corresponding numerals reinforcing the learning fun. You can get your copy at your local book store or online at stores like PenguinRandomHouse.com or Amazon.